Suggestions & Requests / Extended Piano Sounds? General Discussion / Blockland Relics? I'm compiling a little museum or archive of sorts just for fun and was wondering if anyone had any relics from the past they'd like to share? Suggestions & Requests / Dinosaur Bots? Hey, so I've been gone for a little while, and was wondering if there were any dinosaur bots out there, or if someone could make them in the future? I'm talking like raptors, T-Rex, triceratops, mosasaurus and whatnot. Off Topic / What exactly have I missed? You can tell I've been away for a long time when I can't even remember if this is the correct board to post this is. Pretty wacky stuff. Anyway, it's been a long time, and I'm not talking about the Enterprise song. What have I missed? What have I not missed? What will I miss? I look forward to becoming part of the community again and am well aware that some of you will not welcome by return. Is the best they can do to connect with todays youth? "Cardinal Ravasi stated that the church should be doing all it can to take full advantage of the internet as a way of getting the message of God to the masses." I don't think the majority of the internet will be happy about this. I really want to know more about them. He's been involved with them since he was 24. They seem to have disappeared. The server is closed due to an administration reform and will be back shortly. Thank you for your patience. They seem to have left. Yup, he has Star Wars and Star Trek in his hands now. Do you think it was live up to the previous 6? Off Topic / Identify this music please! Oh not you again! Channel 4 always ruining my viewing experience. A blasted advert came on at the very emotional bit at the end of Lord of the Rings : Return of the Kings. Channel 4 apologised today after coming under fire from Lord of the Rings fans for interrupting an emotional final scene from the last film in the trilogy with an advert for an upcoming programme. There was fury last night when a half-screen advert with a voiceover came on as Gandalf (Sir Ian McKellen) walked with Frodo Baggins (Elijah Wood) at the end of the 2003 film Return of the King. 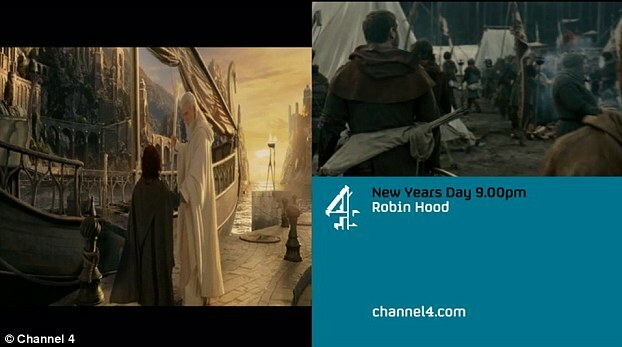 The advert was for 2010 film Robin Hood starring Russell Crowe, being shown on New Year's Day, and there was also a short trailer for 2011 film Wuthering Heights, which followed the programme. A Channel 4 spokesman told MailOnline tonight: 'We take great care to ensure that continuity announcements are scheduled appropriately. Did any other Brit encounter this?